The first time I had biscotti was not long after Tom and I were dating. We were at his parents house and his mom picked it up somewhere. I wasn’t expecting to like it since it just looked like an overcooked and hard sugar cookie but I was pleasantly surprised with the flavor and mild sweetness. For the Secret Recipe Club I hadn’t planned on making biscotti though. I’m on a bit of a coconut kick lately so when I found the Chewy Coconut Lime Sugar Cookies I chose them right away. But once the dough was formed, I took one look at it and knew right away it would behave like my snicker-doodle cookies do. Which means no matter if I refrigerate the dough, bake it for less time, flatten the cookies or non flatten the cookies, I end up with a sheet pan sized cookie, not individual cookies. I ended up trying it anyway and that’s exactly what I ended up with. But since they were so good I’ve decided I’m going to make them again, probably in bar form and share them with you soon. Back to the drawing board. Or really, back to The Cookin’ Chemist’s recipe index to choose another recipe. And that’s when the biscotti recipe jumped out at me. I drink coffee every morning while at work. Why in the world wouldn’t I make some biscotti to go along with it? 1. Preheat oven to 325. Line a large baking sheet with a silpat or parchment paper. 2. Combine the eggs and sugar together in the bowl of your stand mixer. Beat for 3 minutes; until pale yellow and fluffy. 3. Meanwhile, in a large bowl combine the flour, cornmeal, baking powder and salt. Then slowly add the flour mixture to the stand mixer and beat until combined. Let stand for 5 minutes. 4. Use a rubber spatula sprayed with non-stick cooking spray to scoop the dough into two equal sized logs on the prepared baking sheet. Wet your hands and mold the dough into log shapes. Bake for 30-35 minutes or until lightly browned. 5. Transfer to a wire rack and let cool for 5 minutes. Slice the logs into 1/2″ long strips. Place the strips back onto the baking sheet and bake for another 20-25 minutes or until golden brown. Transfer again to the wire rack and let cool to room temperature. 6. 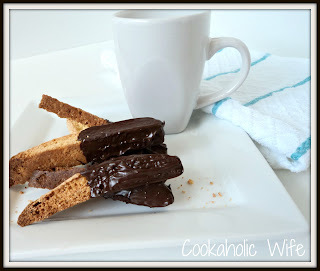 Melt the chocolate and dip one end of the biscotti into the chocolate, using a wooden spoon or pastry brush to cover the biscotti evenly and shake off excess chocolate. Place the biscotti on a baking sheet covered with wax paper. 7. Refrigerate until the chocolate is firm, at least 30 minutes. Transfer to an airtight container to keep for 4 days or wrap in foil, place in a reseable bag and freeze for up to three weeks. The original recipe includes the zest or an orange and a lemon, but I’m a bit of a chocolate purist in the sense that unless its a strawberry, don’t put fruit near my chocolate. I could not get over how easy these are to make. For some reason I assumed that biscotti was difficult and labor intensive. Not in the least! But now, on top of the muffins I have for breakfast this week, I also have 30 slices of biscotti. I think my coworkers are going to get some treats.